Game Recap: @OHLBarrieColts beat the @OHLBattalion 3-2 in Game 1. #OHL - Very Barrie Colts | A website covering the Barrie Colts of the OHL. 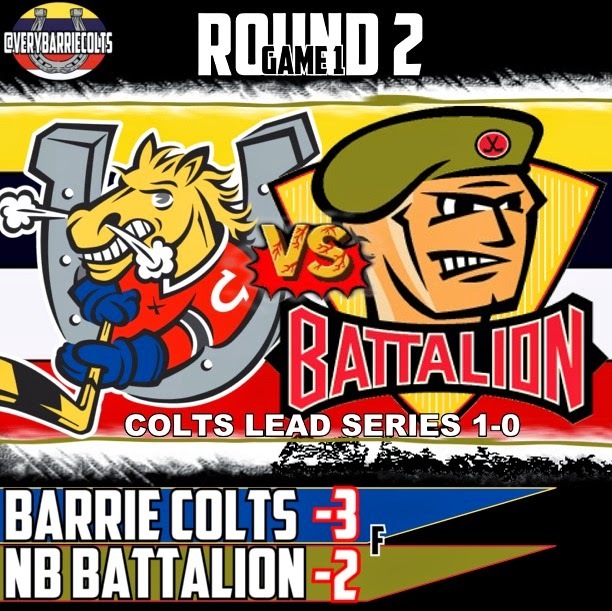 Last night the Barrie Colts defeated the North Bay Battalion in game 1 of the second round of the playoffs by a score of 3-2. Barrie now leads the Eastern Conference Semi Final series 1-0. It was not only a big win for the Colts but it also saw the return of Brendan Lemieux to the lineup who has been out for some time with a hand injury. Lemieux played great in his return logging some hard minutes, working with different lines and he played a very disciplined game. There were moments when things got heated and you could see North Bay players trying to get under his skin and he would just skate away. Lemieux also assisted on the game winning goal. First Period: First period was exactly what you would expect between these two teams. A tight match up with a lot of physicality and scoring chances. Andrew Mangiapane scored the first goal of the series on a power play at the 6:41 mark of the period. The goal would be Andrews 5th of these playoffs and both Andersson and Hooey were credited with assists. A few minutes later Joseph Blandisi would be called for slashing and North Bay would make them pay. Nick Moutrey would score his first of the playoffs with both Paul and Wood assisting on the goal. That would tie the game at 1-1. An incredibly hard hitting period and it seemed that for the most part the officials put their whistles away, well, compared to how the last series was called. Barrie had the edge in shots 12-10 after the first period. Second Period: Similar to the first period but with more chances. Both teams were pushing hard to get the lead but it would be Barrie that would regain the lead on a Jonny Laser goal 7:29 into the period. Hooey's assist would be his second on the night and Justin Scott also assisted on the goal. McIvor was sent to the penalty box at 7:38 for high sticking and with the momentum following the Laser goal it seemed certain that the Colts would extend their lead but it didn't work that way. Ryan Kujawinski would end up getting a short handed goal to tie the game at 2-2. The goal was Ryan's 3rd of the post season. Both teams would exchange chances, hits and even fists. Barrie Colt rookie Adrian Carbonara looked like he wanted a fight ever since Hawerchuk took a huge hit and he would eventually get his fight when Zach Bratina accepted. The period would end with both teams tied at 2-2. Colts out shot North Bay 16-15. Third Period: Barrie would strike first in the 3rd period when Joseph Blandisi would score his 5th of the playoffs to put the Colts up 3-2. Brendan Lemieux and Kevin Labanc assisted. Following the goal it appeared that Blandisi wanted to climb into the crowd. If you want to get the fans at BMC going, THAT is the way to do it. Third period was mostly North Bay. They were all over Barrie in their zone and ended the period out shooting the Colts 11-2. Mackenzie Blackwood played unreal, especially in the 3rd period and though the Battalion had some good looks, Blacky was up to the task. Despite having a slow 3rd period. Though they out shot North Bay through 2 periods, North Bay would end up out shooting them 36-30 following a strong effort in the third period. Garrett Hooey was the only player to register more than one point with his 2 assists. Joseph Blandisi took 3 minor penalties in the game. Barrie went 1-4 on the power play and allowed 1 goal on 3 penalty kills. Attendance at BMC was 4021. Game 2 is scheduled for this Sunday at BMC. Puck drop is scheduled for 6:00 pm. A Very Barrie Colts Blog will be at the game so if you are there come say hi.